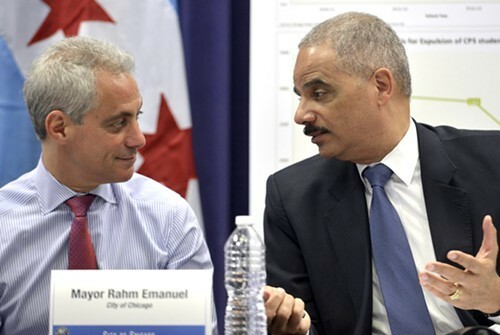 Mayor Rahm Emanuel recruited U.S. Attorney General Eric Holder to hail a drop in crime in Chicago—and then dozens were shot over the weekend. A couple days before the Fourth of July weekend, Mayor Emanuel had what I call a "mission accomplished" moment. It's so named for that surreal point in 2003 when President George W. Bush donned a flight suit, jetted onto an aircraft carrier off the coast of San Diego, and, under a banner proclaiming "Mission Accomplished," gave a speech in which he essentially said the war in Iraq had been won. That's the same war that—11 years later—is still being waged, at least among Iraqis. In Mayor Emanuel's case, he did nothing so flamboyant as dressing up in a costume. Instead, he schlepped in U.S. Attorney General Eric Holder—apparently always willing to be a mayoral prop—for a staged press event at which the mayor declared this year had been the "safest on record" for public school students in Chicago. “I don’t think that this community, this mayor, the leaders from this community get enough credit for it," Holder added at the July 2 event. Alas, a few days later came the weekend, when 82 people were shot, 14 of them fatally—including one 14-year-old CPS student. The mayor's press releases and press conferences have become a big joke with reporters, who can't get over how shameless he is when it comes to giving himself credit for any old thing. But in this case it's hard to laugh. In general, I'm a big believer in not blaming Mayors Daley or Emanuel for the years and years of violence that have happened on their watch. The madness at the root of this violence is beyond any single explanation—as my colleague Mick Dumke has reported more than once. I certainly don't have the answers. As you know, there's a whole lot of things I wish Mayor Emanuel would do to help fight the poverty at the heart of so much of this violence. At the very least, I wish he'd use his bully pulpit to demand more federal funding for schools, clinics, and parks in crime-ravaged communities. But even the harshest mayoral critics—like yours truly—should refrain from using every outburst of violence to slam him. Conversely, our mayor should just say no—as hard as this may be—to holding press conferences at which he takes credit for solving problems he clearly doesn't even know how to address.